Just reduced by 35,000 euro! A plot of 2522sq.m. with 360 degree panoramic sea and mountain views to Kefalonia and Alikes located in the traditional Greek village of Katastari. The plot is elevated and in a quiet location only a short walk from all amenities and 5 minutes from a beach. It is surrounded by countryside and contains 47 mature olive trees. It is located within walking distance of Katastari the largest village on the island. The village has a police station, post office, bakery, supermarket, pharmacy, tavernas and much more. 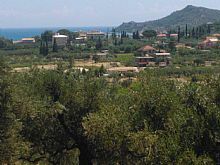 Katastari is 17kms north west of Zakynthos town, port and airport. The nearby beaches of Alykes, Alykanas, Psarou and Amoudi are known for their golden sand and shallow clear blue waters and all have been awarded the Blue Flag award for cleanliness. The municipality of Alykes has a rich history with many ancient buildings, churches dating back to the 16th century, old caves and the people have a genuine warmth and friendliness. In Alykes and Alikanas there is plenty of entertainment with a wide range of bars and tavernas for all tastes and shops offering a wide range of products. A building licence was issued in 2011 for a two storey villa with basement. The plans are available. Mains water and electricity are available..
* Selling prices are in Euros. Currency conversion to a sterling equivalent is approximate and for illustration purposes only. The exchange rate is updated regularly.